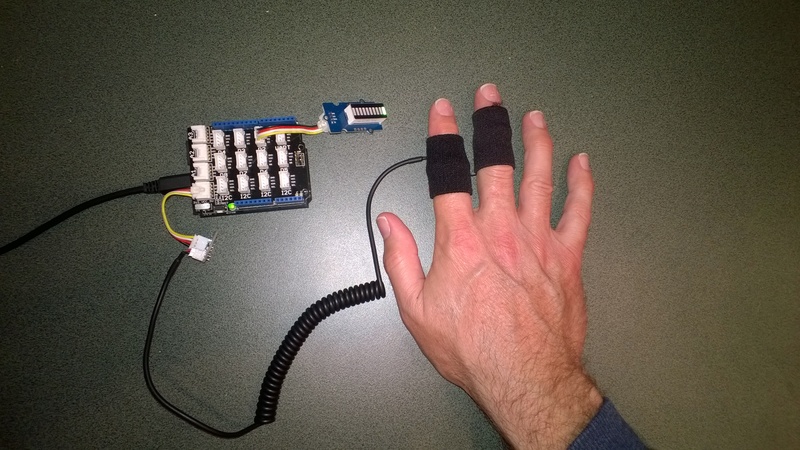 One of CodeClub’s sponsors is Orion Health so I have been evaluating sensors suitable for health focused projects. We already use the SeeedStudio Grove Heart rate sensor and Grove EMG Detector, so I purchased a Grove GSR sensor for testing. Galvanic Skin Response(GSR) is a method of measuring the electrical conductivity of the skin, which depends on the amount of sweat on the skin. The GSR detector outputs a single analog signal which I connected to A0. For the evaluation I averaged the first 3000 samples to determine the initial offset, then sampled roughly every 100mSec. I’m a bit worried about the robustness of the wires connecting the two probes to the black cable so it will be interesting to see how long they last at Code Club. I also updated the Minimum and Maximum values with each sample as this appeared to make the display more reliable. I found the display responded well to me holding my breath for as long as I could. Pulse rate + EMG + GSR = Polygraph or DIY lie detector maybe a project for next term. This entry was posted in .NetMF, CodeClub, Education, Netduino, SeeedStudio and tagged Analog input, CodeClub, education, Netduino, NetMF, seeedstudio. Bookmark the permalink.